Blogger outreach rocks. About a year ago, Sumo sent me a a little Otto thingie to review, and I love it, so I was happy when they asked me to review (as in get a free one) their Sumo Omni. Like a lot of bloggers, Omni is quirky, funky, and different. 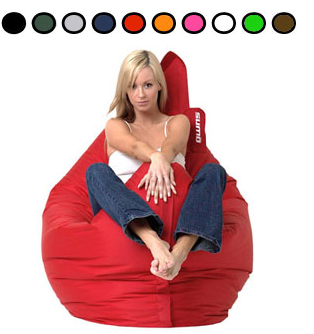 It’s also unlike any other bean bag chair you’ve ever seen because it’s not a floppy blob. Sumo has used blogger outreach to get their furniture reviewed, and it’s smart marketing. Sending chairs to bloggers is cheap; effective because you feel like you need to review something that costs more than $100; and, unlike a book, way too big to ignore once it gets to your house. They didn’t send some stupid press release, or cutesy pitch. They just sent an email asking if I’d like to try the chair and review it, with a link to the site. The $129 Sumo Omni conforms to your body when you sit or lay or plop on it, and it’s also great for jumping on and sliding across the floor. Over the weekend, I submitted it to some pretty rigorous testing :>) I took a nap on it, used it as a computer chair, read the paper on it, talked on the phone on it, fought the dog and the cat for it before deciding to share it with them, spilled coffee on it (accidentally, and it just ran right off) – and this thing is great. In fact, if I had a bigger space, I’d have a bunch of them so people wouldn’t have to fight over who gets to hang out in it. It’s a little hard to get out of, but not so hard that you need to worry about it. The Omni is made of ballistic rip-proof nylon, filled with Virgin Polystyrene Foam (little white foam balls), 4.5′ x 5.5′ and it weighs 18 lbs. You can replace the foam beads when they eventually flatten down. Internet marketing changes with each passing day and a tip or method that worked a couple of months ago, will probably not be of much use to you today. Marvan – that’s true if your tips are related to the latest shiny object or fad. but getting media with large audiences to try your product and write about it is not a method that’s going to stop being useful.